Hong Ra-hee, the wife of Samsung chairman Lee Kun-hee, on Monday resigned from the top post at the Leeum Samsung Museum of Art. Hong is stepping down for "personal reasons," the Samsung Foundation of Culture, which runs the museum, said in a statement. A source at the foundation said the move is not due to health reasons. 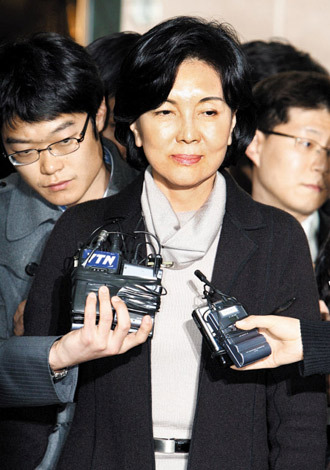 The decision comes as Hong's husband remains in a coma after a heart attack in late 2014 and her son Lee Jae-yong has been arrested for bribing President Park Geun-hye. Hong, who majored in art at Seoul National University, has been a powerful figure in Korea's art scene and is among the world's top 200 art collectors according to trading platform Artnet. She is also on the board of London's Tate Gallery and the Museum of Modern Art in New York. The oddly titled Leeum, which portmanteaus the founder family's name with the word "museum," opened in 2004 and has some 150 Korean national treasures in its collection. Hong was accused in 2007 of buying tens of billions of won worth of art to help Samsung amass a slush fund, but the charges were dropped. One of the works was Roy Lichtenstein's seminal painting "Happy Tears." One Samsung executive said, "I believe she made the decision without discussing the matter with other senior Samsung staff. It seems the mood at Samsung is too grave to make such suggestions." Another Samsung source said, "She is also a mother and wife. How could she conduct her duties at work when her son is in jail and her husband is gravely ill?" Hong's resignation has rattled the local art world. One head of an art gallery said, "Samsung has been the most active in supporting the arts and she appears to have been very disappointed by the latest events that have stoked public anger against the conglomerate."